After reading here about the Wandering Soul Steve Dewey, co-author of an excellent history of the Warminster UFO saga, In Alien Heat, emailed me to point out the uncanny similarities between the mirage men – PSYOPS units who exploit and manipulate folkloric and religious beliefs – and the ‘Missionaria Protectiva’, a faction of the Bene Gesserit order in Frank Herbert’s sci-fi epic Dune (1963/5). The Bene Gesserit practice “religious engineering” through a faction called the Missionaria Protectiva, which spreads contrived myths, prophecies and superstition (collectively known as Panoplia Prophetica) among the populations of the Empire. A Bene Gesserit may then later take advantage of the prophecies, casting herself as a guide, protector, or some other figure in fulfillment of the prophecy, in order to manipulate the religious subjects for protection or other purposes. These myths also exploit religion as a powerful force in human society; by controlling the particulars of religion, the Bene Gesserit have a manipulative lever on society in general. Mirage men (actually, women) in all but name, the aristocratic, ruthless Missionaria Protectivat reflect Herbert’s own progressive, sceptical views on the abuses of power, authority and religion. Educated by Jesuits, he developed a healthy mistrust of religious authority from an early age: ‘When religion and politics travel in the same cart, the riders believe nothing can stand in their way’ (Dune). Herbert spent six months as a photographer with the US Navy Seabees construction unit in WWII, a position which wouldn’t have given him an inside track on sensitive real-life PSYOPS work, though of course he may have researched the area while preparing Dune. 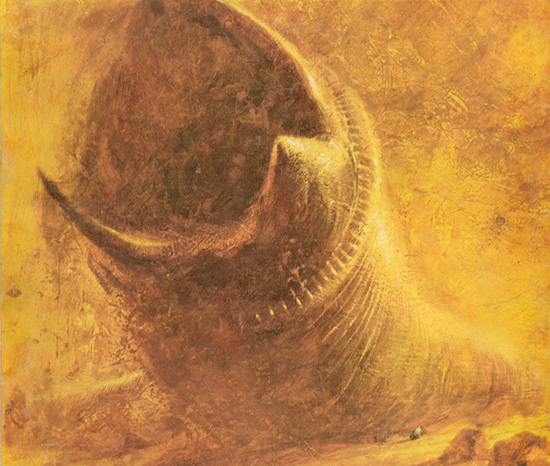 PS: I’ve never actually read Dune, though I am a big fan of David Lynch’s film adaptation.